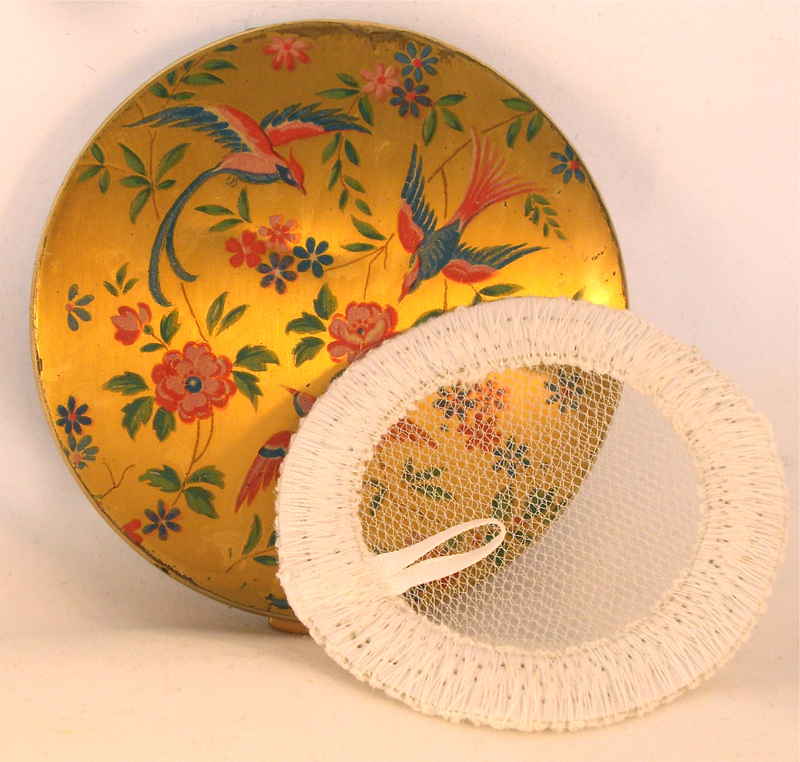 The finished sifter for my own 1950’s Coalport vintage compact – very used and very loved! 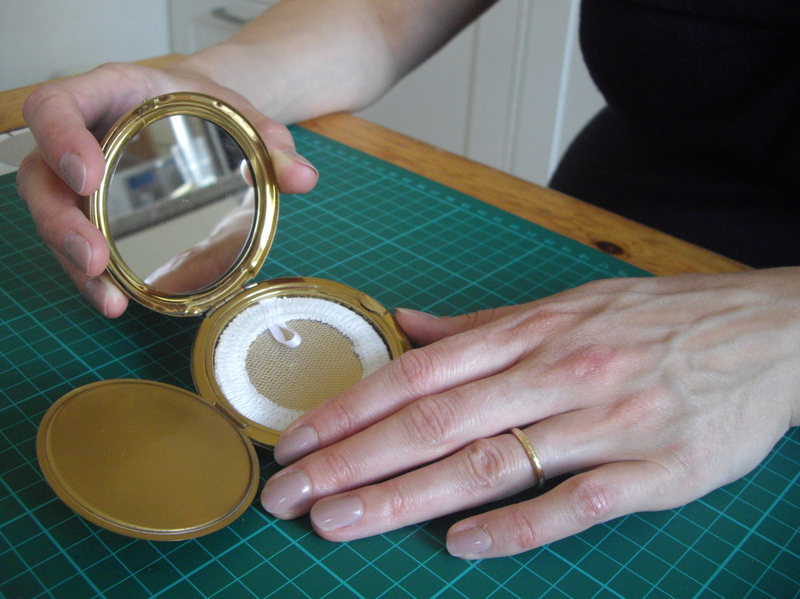 As most pre-1960 vintage compacts were made for loose powder, all too often they have lost their original “sifter” – the little gauze sieve to hold the powder safely in place. My easy method of making your own is based on the sifters I find in British compacts from the early 1950s. Here I’ve made a round sifter, but you can adapt the shape to give any vintage compact a new lease of powdering life! You can see this “How To” in print in this month’s Vintage Life Magazine. 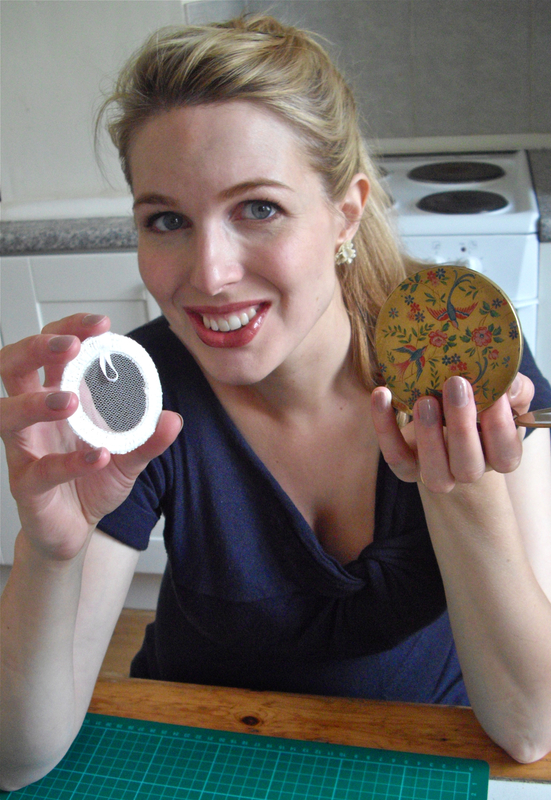 I’ve also written more about refilling vintage powder compacts. Measuring… in my unusually clean kitchen! If you can, ask a friendly newsagent or stationer to laminate your card for you. This gives the best flexibility and strength for your sifter. If laminators are in short supply, stick two layers of card together with a good coating of PVA glue. Leave this to dry completely. Measure the inside shape of your compact carefully, then draw this shape on your card. Cut out with scissors or craft knife. Me doing some careful cutting – you can see my baby bump under the table! Check the size of your card by popping it into your compact. It should sit fully inside the powder container, with a tiny (1/2 – 1mm) gap all the way round (we’ll fill this gap when sewing the sifter in Step 7). Shave off a little sliver at a time with your scissors until you have the perfect fit. Don’t worry if the edge of your card starts to look messy. This will be hidden when you sew the sifter. Draw another cutting line on your card, between ½ and 1cm from the edge. Be as generous as possible as the more width you leave, the stronger your sifter. 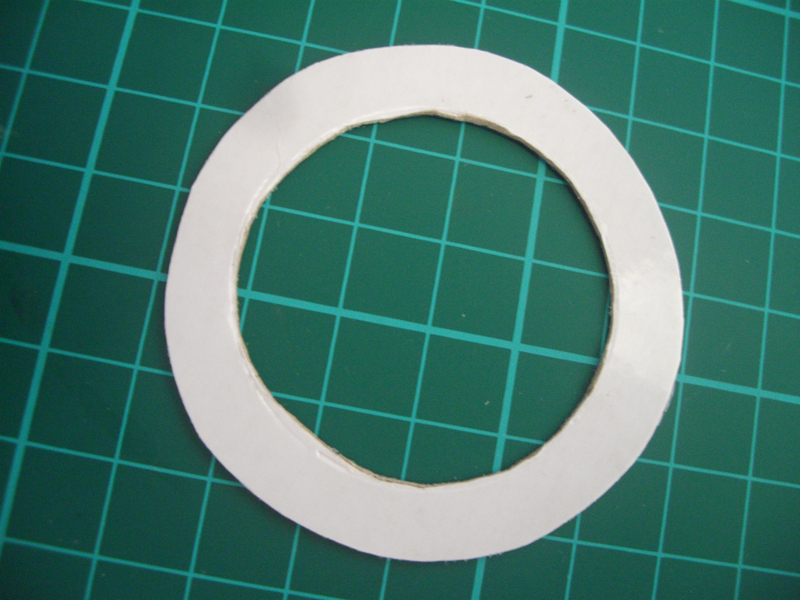 Cut out the centre of your shape along this line to make your sifter ring. Pin your ring to your fabric as shown. 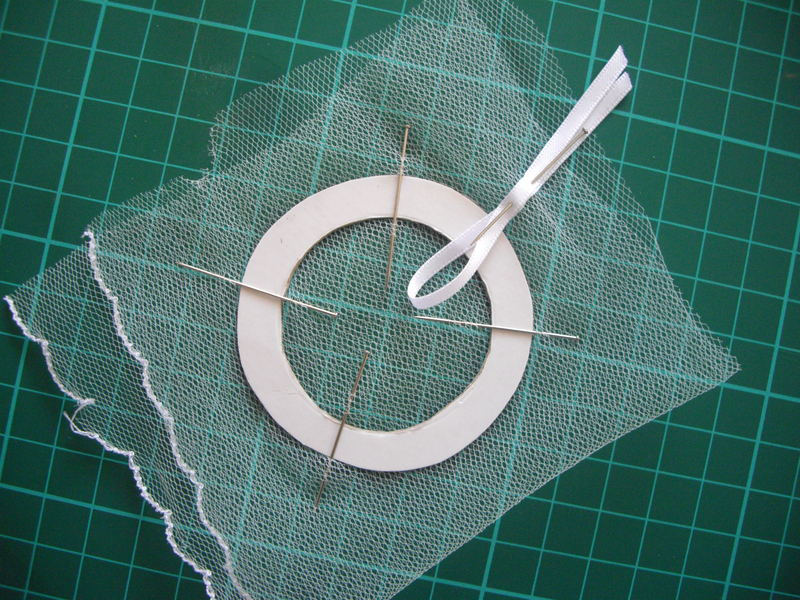 Use a double thickness of net, or a single thickness if you’re using cross stitch fabric or those old tights. Pin a loop of your ribbon fully across the ring as in my photograph. Now the sewing bit. The simplest way is to use a sewing machine with a blanket stitch (like I’ve used) or zig-zag setting. However, if you prefer to hand sew, use blanket stitch and a strong button-hole thread. 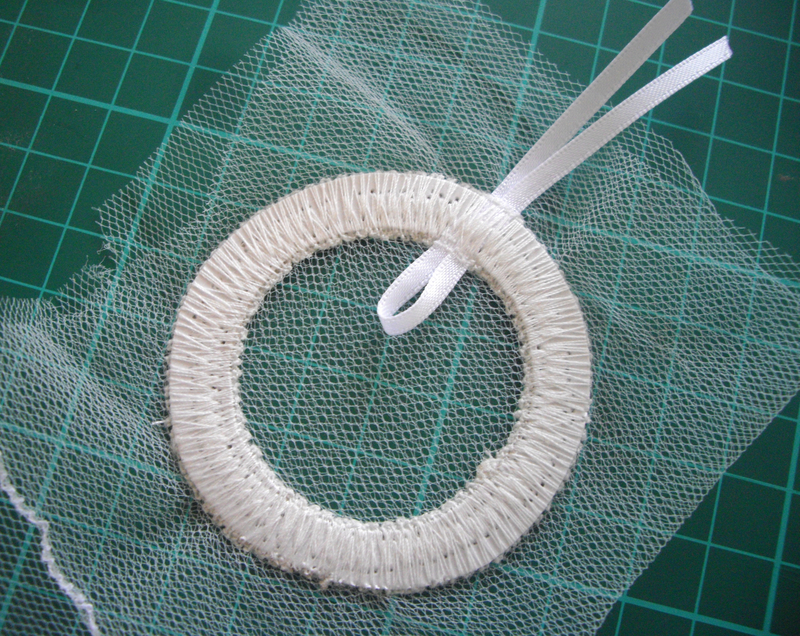 Start by sewing the inside edge of the sifter ring. Choose the lowest setting for your stitch length, and a stitch width of around 5-6mm. Stitch completely around the inside edge as shown. Stitch through the fabric and card and over the ribbon loop. Remove the pins as you sew. Increase your stitch width to the maximum on your machine (7mm on mine). Then sew around the outside edge of your sifter. As before, sew through the card, fabric and ribbon. This new line of stitches will overlap your first, giving your sifter extra strength. 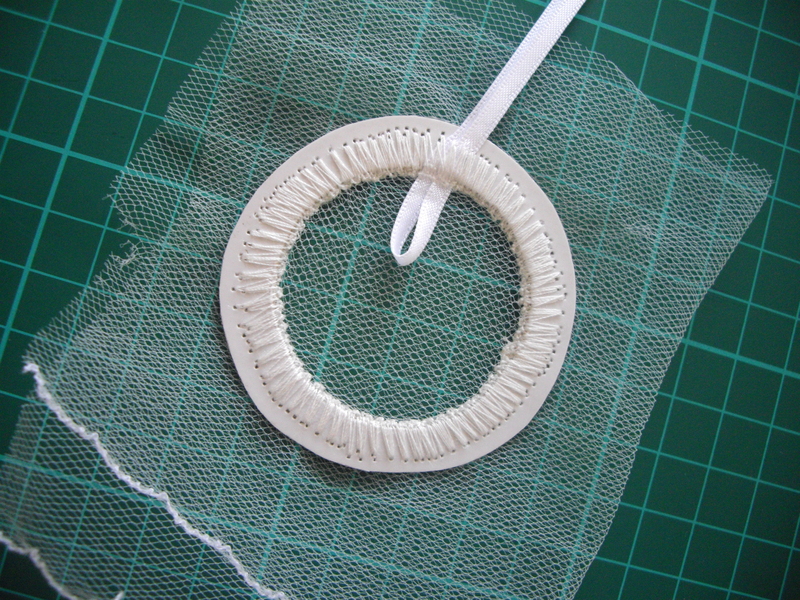 Once you’ve sewn around your sifter, take a quick look. If you can still see a messy cardboard edge, sew around again a second or third time to hide the card completely. Now cut the excess fabric and ribbon away from the outside edge. Cut close to your stitches but take care not to snip any. A little bit of fabric left all the way around will help your sifter sit snugly in your compact. If you do snip any threads, simply sew over them again with your blanket/zig-zag stitch. Your new sifter is ready to use! Place a small amount of your favourite loose powder in your compact, pop your sifter on top, then dab with a powder puff to apply. Happy vintage-style powdering! 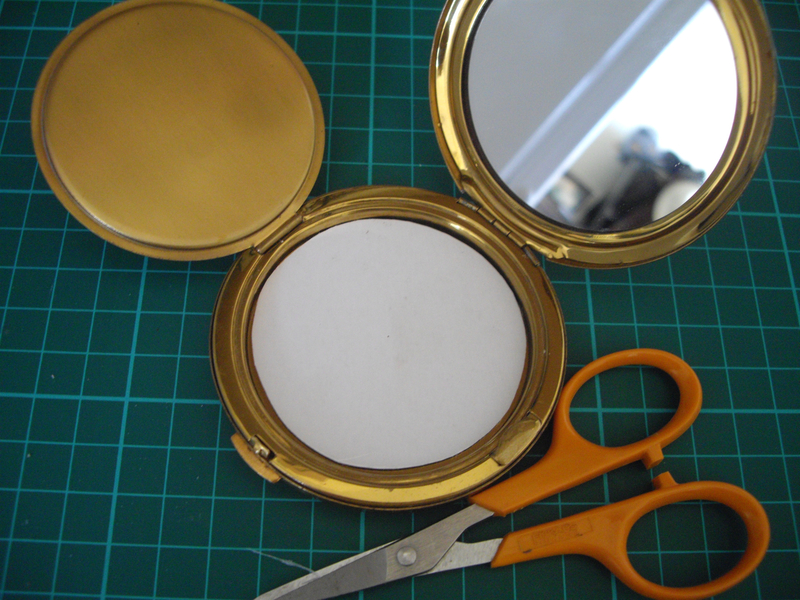 You might also like my post on The Use, Care and Repair of Vintage Stratton Compacts. My hard work over with a cheesy “finished!” shot! How useful. I’m afraid I’m slightly smug re sifters (an unusual type of smug) at the moment because I picked up a Stratton convertable for a couple of quid at a car boot then discovered it was so mint it not only had its sifter, but also its instruction leaflet and a small ‘checked by’ quality slip inside! BUT in the past I have passed up ones with the interior sifter missing so I will bookmark this for next time I see a pretty-outside-old-inside compact! Hey, I find your blog lovely and very informative, I recently purchased a Stratton powder compact and it has no puff. I live in México and it is very difficult for me to purchase an original one. Which puffs would you recommend buying or how can I make my own puff? Thanks. Thank you, thank you! I have a silver compact that was a wedding present from my grandfather to my grandmother in the early 1930s. Now I know it’s a loose powder compact and how to make a replacement softer. Can’t wait to start using it. Thanks for the great tutorial, what a gorgeous website you have, and congratulations on reaching over 200 compacts! I’m afraid I haven’t yet seen square replacements :( Good luck with your search and sewing machine experiments! And how lucky to have a musical compact! Oh rats, oh well, worth a try! :) Thanks! I would so love a tutorial on making my own puffs, we have geese and I love to gather their down….can anyone help?…. This entry was posted on October 19, 2011 by Jane Vanroe in Advice for powder compact collectors, my vintage powder compacts and tagged how to fill a compact with powder, how to make a powder sifter, how to refill a vintage compact, vanroe powder compacts, vintage powder compacts.